How to enter an SKU for my Ebay listings? This article will explain how to add an SKU to your eBay listings. 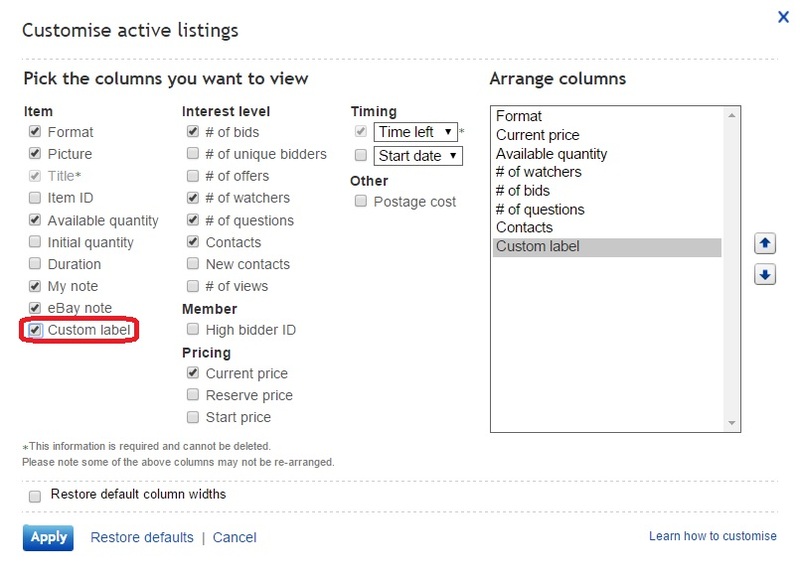 In your eBay account, go to the 'Active Listings' page in the Selling Manager area. You will see a small 'Customize' button at the top right of the listings, click on this to open up the list of items you can add in the main page. The following image is where you can choose which of the available fields you would like to display, this is where you choose 'Custom Label' as shown below. As shown in the image below, you will see an 'Add' button, this is where you will add the SKU of the product which will be imported into One Stop Order Processing as the SKU of the product.